When in doubt about what to cook for large family gatherings, I’ve found that anything combining cheese and potatoes is sure to be a hit. My favorite crowd-pleasing side dishes include twice-baked potatoes, garlic mashed potatoes and creamy potatoes au gratin, all made with copious amounts of cheesy goodness. 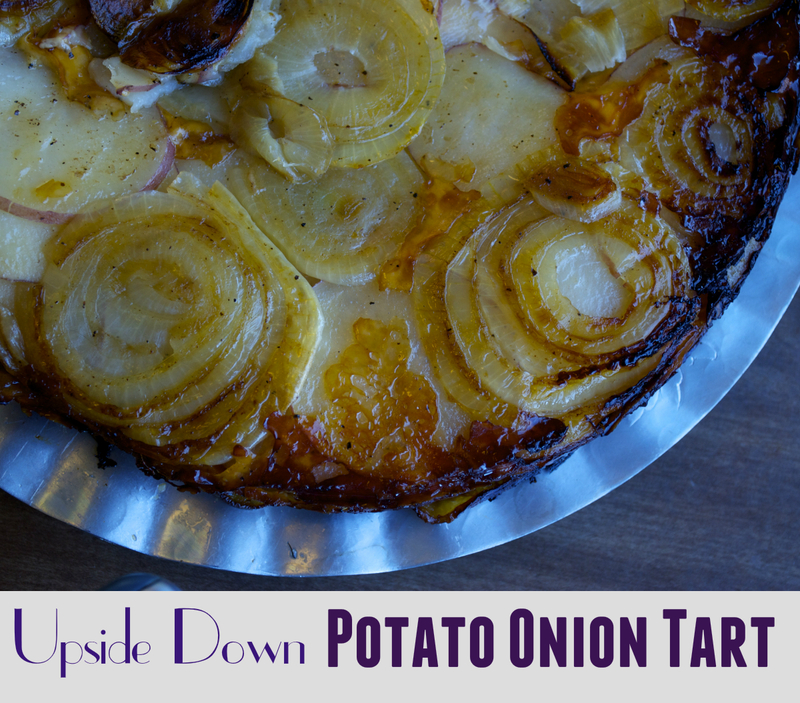 Keeping that in mind, I decided to make this gorgeous-looking upside down potato onion tart to go with last Sunday’s Easter ham. That decision was a difficult one as I had never made the recipe before and cooking something for a group of people without a trial run is a little unusual for me. I’m a firm believer in trying recipes out before subjecting people to them! But this recipe looked fairly simple to make and just reading the ingredient list gave me confidence: potatoes, onions, cheese, butter, herbs. With such humble and tasty ingredients, how could it not turn out delicious? Happily, it was everything I wanted it to be — the potato layers were sandwiched between caramelized onions and sharp pecorino, making this a truly decadent dish. The edges (my favorite part) were crisp and cheesy and the center was creamy and luxurious. Surprisingly though, for all that flavor, the recipe used only a bit of butter and didn’t even call for cream! Since I was cooking for nine adults, I tripled the recipe. We like to eat and I knew that any leftovers would be given a happy home. This change did require a slight variance from the directions. The original recipe instructs you to go from the stove top to the oven using the same pan. 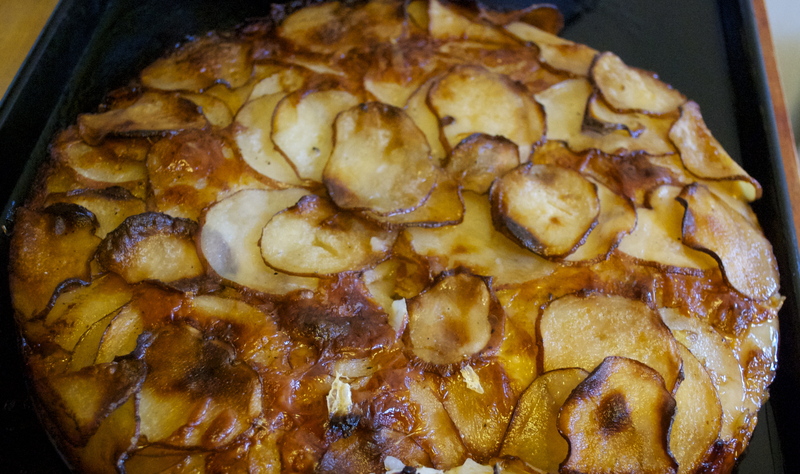 Since I knew my cast-iron wouldn’t fit all of the extra potatoes, I greased up a 12-inch springform pan to use in the oven. I started out as instructed though, with a pan on the stovetop full of melted butter and sizzling rings of yellow onion. As each ring became a deep golden brown I took it out of the pan and put it in the base of the springform. When the last onion ring was removed, I sautéed three minced cloves of garlic in a dab of butter. I had forgotten to buy thyme at store and figured this would pump up the flavor. 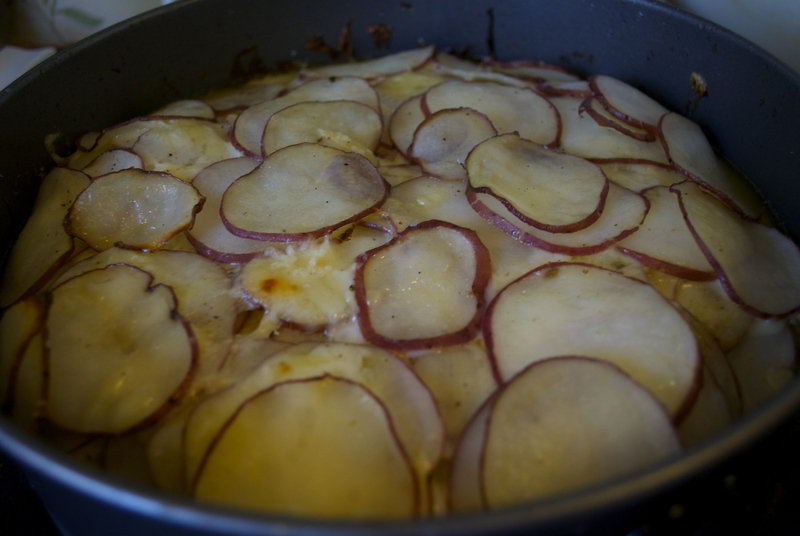 Once I had the bottom of the pan filled with caramelized onion rings, I layered in the potatoes and grated cheeses (I used a combination of mozzarella, Gruyère and pecorino). The garlic and any extra onions were added too, along with a good amount of salt and pepper. I added layers until I reached the top of the pan and then popped it in the oven. This is what it looked like halfway through the cooking process. The potatoes shrunk quite a bit — I was actually a little nervous that it wouldn’t be enough food. Thankfully I was wrong! 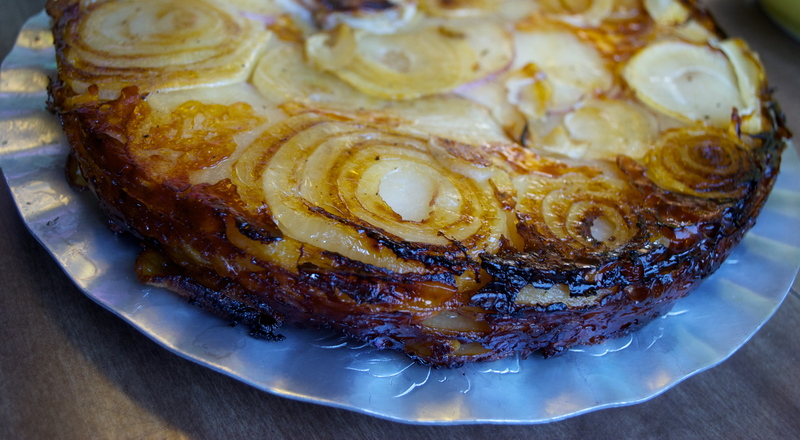 Inverted Potato Onion Tart — I love the swirls of caramelized onion! In hindsight I wish I had gotten a bit more color on the onions as they didn’t get any darker in the baking process. And I wish I had squished more onion rings into the base layer. But still, it was a masterpiece — a tasty, tasty masterpiece — and I can promise you I will be making this again and again! 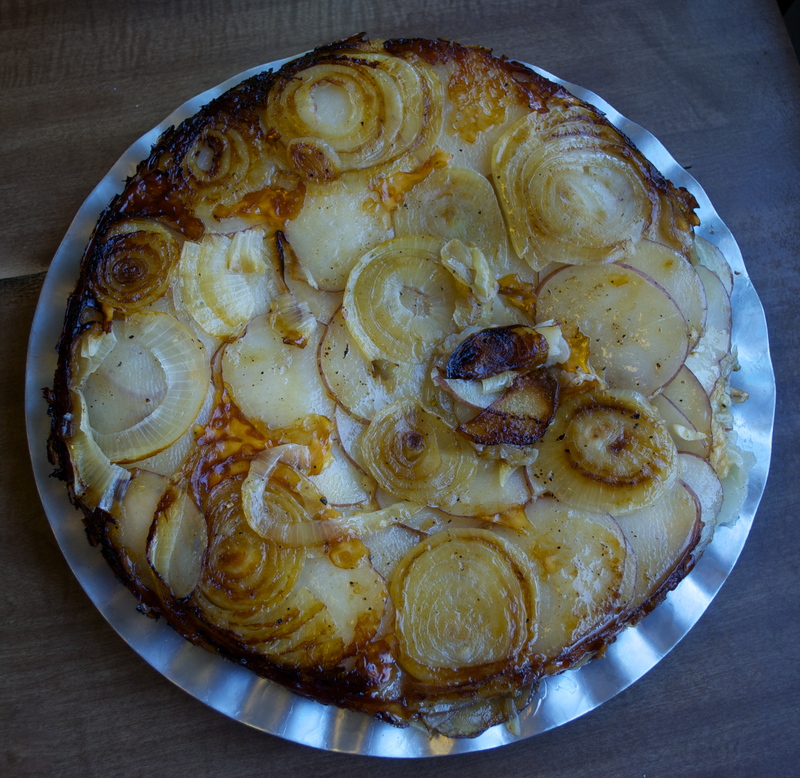 This entry was posted in Edibles, Holiday Food, Sides/Veggies and tagged bestthingever!, cheesy, easter, family, food, gratin, life, pinterest, potatoes, recipes by Jessamine in PDX. Bookmark the permalink. I would love to be a guest @ your table! Thanks — and apparently my family agreed. I was lucky there was one piece left for me to take for lunch the next day! Crispy cheesy oniony creamy mmm!